Purpose: The web-based Food Behaviour Questionnaire (FBQ) includes a 24-hour diet recall, a food frequency questionnaire, and questions addressing knowledge, attitudes, intentions, and food-related behaviours. The survey has been revised since it was developed and initially validated. 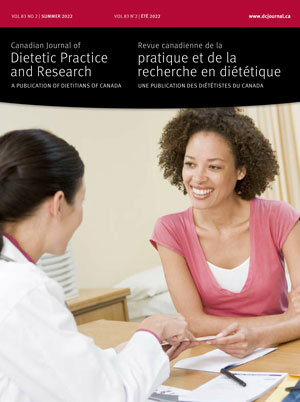 The current study was designed to obtain qualitative feedback and to validate the FBQ diet recall. Methods: “Think aloud” techniques were used in cognitive interviews with dietitian experts (n=11) and grade six students (n=21).Multi-ethnic students (n=201) in grades six to eight at urban southern Ontario schools completed the FBQ and, subsequently, one-on-one diet recall interviews with trained dietitians. Food group and nutrient intakes were compared. Results: Users provided positive feedback on the FBQ. Suggestions included adding more foods, more photos for portion estimation, and online student feedback. Energy and nutrient intakes were positively correlated between FBQ and dietitian interviews, overall and by gender and grade (all p<0.001). Intraclass correlation coefficients were ≥0.5 for energy and macronutrients, although the web-based survey underestimated energy (-10.5%) and carbohydrate (-15.6%) intakes (p<0.05). Under-estimation of rice and pasta portions on the web accounted for 50% of this discrepancy. Conclusions: The FBQ is valid, relative to 24-hour recall interviews, for dietary assessment in diverse populations of Ontario children in grades six to eight.